You are going to love the squishy, plump nature of Farmers Daughter Juicy DK! The 8-ply construction combined with the spin is what gives it the springy feeling that we all love to work with. Made from 100% superwash merino wool, this hand dyed yarn will be perfect for that favorite sweater, cold weather accessory, or blanket that you have on your list of projects. Farmers Daughter Foxy Lady is a single ply blend of superwash merino and silk. The sheen of the yarn is enhanced by the gorgeous colors inspired by Montana. 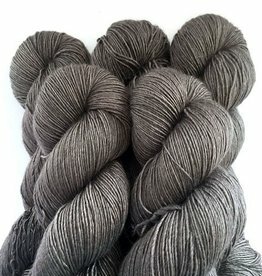 Farmers Daughter Fibers Mighty Mo is a mohair and silk blend lace weight yarn that is available in a gorgeous earthy color palette. Hand dyed in Montana. Craggy Tweed is a dk weight yarn that mixes traditional with modern for a rich and vibrant hand dyed yarn experience. We love how this yarn looks in colorwork!